^ Discovery Circumstances: Numbered Minor Planets (90001)-(95000). IAU: Minor Planet Center. [2008-07-23]. ^ 2.0 2.1 2.2 Buie, Marc W. Orbit Fit and Astrometric record for 90377. 黃道巡天計畫. 2007-08-13 [2006-01-17]. ^ 3.0 3.1 3.2 3.3 3.4 A. Pál, C. Kiss, T. G. Müller, P. Santos-Sanz, E. Vilenius, N. Szalai, M. Mommert, E. Lellouch, M. Rengel, P. Hartogh, S. Protopapa, J. Stansberry, J.-L. Ortiz, R. Duffard, A. Thirouin, F. Henry, A. Delsanti. “TNOs are Cool”: A survey of the trans-Neptunian region. Astronomy & Astrophysics. 2012-05-01, 541 [2018-04-02]. ISSN 0004-6361. doi:10.1051/0004-6361/201218874 （英语）. ^ 5.0 5.1 AstDys (136199) Eris Ephemerides. Department of Mathematics, University of Pisa, Italy. [2011-05-05]. （原始内容存档于2011-06-04）. ^ 7.0 7.1 AstDys (90377) Sedna Ephemerides. Department of Mathematics, University of Pisa, Italy. [2011-05-05]. ^ Tancredi, G.; Favre, S. Which are the dwarfs in the solar system? (PDF). Asteroids, Comets, Meteors. 2008 [2011-01-05]. ^ Michael E. Brown. How many dwarf planets are there in the outer solar system? (updates daily). California Institute of Technology. 2011-09-23 [2011-09-23]. （原始内容存档于2011-10-18）. ^ Discovery of a candidate inner Oort cloud planetoid (PDF). Mike Brown. 2004-08-10 [2012-07-18]. ^ 15.0 15.1 15.2 15.3 15.4 15.5 15.6 Mike Brown, David Rabinowitz, Chad Trujillo. Discovery of a Candidate Inner Oort Cloud Planetoid. Astrophysical Journal. 2004, 617 (1): 645–649. Bibcode:2004ApJ...617..645B. arXiv:astro-ph/0404456. doi:10.1086/422095. ^ 17.0 17.1 Jewitt, David, Morbidelli, Alessandro, & Rauer, Heike. (2007). Trans-Neptunian Objects and Comets: Saas-Fee Advanced Course 35. Swiss Society for Astrophysics and Astronomy. Berlin: Springer. ISBN 978-3-540-71957-1. Page 86. ^ 18.0 18.1 Lykawka, Patryk Sofia & Mukai, Tadashi. (2007). Dynamical classification of trans-neptunian objects: Probing their origin, evolution, and interrelation. Icarus Volume 189, Issue 1, July , Pages 213-232. doi:10.1016/j.icarus.2007.01.001. ^ 20.0 20.1 MPEC 2004-S73 : Editorial Notice. IAU Minor Planet Center. 2004 [2010-07-18]. ^ Walker, Duncan. How do planets get their names?. BBC News. 2004-03-16 [2010-05-22]. ^ MPC 52733 (PDF). Minor Planet Center. 2004 [2010-08-30]. ^ 24.0 24.1 JPL Horizons On-Line Ephemeris System output. Barycentric Osculating Orbital Elements for 90377 Sedna (2003 VB12). [2011-04-30]. (Solution using the Solar System Center of mass#Barycenter in astrophysics and astronomy and Barycentric coordinates. Select Ephemeris Type:Elements and Center:@0) (saved Horizons output file 2011-Feb-04) 互联网档案馆的存檔，存档日期2012-11-19. ^ Chadwick A. Trujillo, M. E. Brown, D. L. Rabinowitz; Brown; Rabinowitz. The Surface of Sedna in the Near-infrared. Bulletin of the American Astronomical Society. 2007, 39: 510. Bibcode:2007DPS....39.4906T. ^ AstDys (90377) Sedna Ephemerides 2003-11-14. Department of Mathematics, University of Pisa, Italy. [2008-05-05]. ^ 27.0 27.1 Hubble Observes Planetoid Sedna, Mystery Deepens; Long View from a Lonely Planet. Hubblesite, STScI-2004-14. 2004 [2010-07-21]. ^ Hubble Observes Planetoid Sedna, Mystery Deepens. Hubblesite, STScI-2004-14. 2004 [2010-08-30]. ^ 34.0 34.1 34.2 Michael E. Brown. 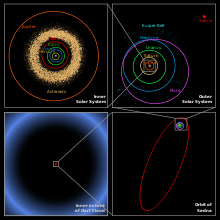 The largest Kuiper belt objects. (编) M. Antonietta Barucci, Hermann Boehnhardt, Dale P. Cruikshank. The Solar System Beyond Neptune (pdf). University of Arizona Press. : 335–345. ISBN 0-8165-2755-5. ^ W. M. Grundy, K. S. Noll, D. C. Stephens. Diverse Albedos of Small Trans-Neptunian Objects. Lowell Observatory, Space Telescope Science Institute. [2007-03-26]. ^ Sedna has no moon say astronomers. 2004-04-14 [2012-07-31]. ^ McKee, Maggie. Distant planetoid Sedna gives up more secrets. NewScientist.com news service. 2005 [2005-03-05]. ^ Alexander, Amir. Sedna: Mysterious Planetoid Slowly Yielding Up Its Secrets. The Planetary Society. 2005-04-18 [2006-09-15]. （原始内容存档于2006-03-06）. ^ Sheppard, Scott S. The colors of extreme outer Solar System objects. The Astronomical Journal. 2010, 139 (4): 1394–1405. Bibcode:2010AJ....139.1394S. arXiv:1001.3674. doi:10.1088/0004-6256/139/4/1394. ^ Trujillo, Chadwick A.; Brown, Michael E.; Rabinowitz, David L.; Geballe, Thomas R. (2005). "Near‐Infrared Surface Properties of the Two Intrinsically Brightest Minor Planets: (90377) Sedna and (90482) Orcus". The Astrophysical Journal 627 (2): 1057–1065. arXiv:astro-ph/0504280. Bibcode 2005ApJ...627.1057T. doi:10.1086/430337. ^ 42.0 42.1 42.2 J. P. Emery; C. M. Dalle Ore; D. P. Cruikshank; 等. Ices on 90377 Sedna: Conformation and compositional constraints (PDF). Astronomy and Astrophysics. 2007, 406 (1): 395–398. Bibcode:2007A&A...466..395E. doi:10.1051/0004-6361:20067021. （原始内容 (pdf)存档于2010-06-09）. ^ 44.0 44.1 M. A. Barucci; D. P. Cruikshank; E. Dotto; 等. Is Sedna another Triton?. Astronomy & Astrophysics. 2005, 439 (2): L1–L4. Bibcode:2005A&A...439L...1B. doi:10.1051/0004-6361:200500144. ^ Hussmann, H.; Sohl, Frank; Spohn, Tilman (November 2006)"Subsurface oceans and deep interiors of medium-sized outer planet satellites and large trans-neptunian objects". Icarus 185 (1): 258–273. Bibcode 2006Icar..185..258H. doi:10.1016/j.icarus.2006.06.005. ^ RickJ. 1.5 hour exposure of Sedna (apmag 21) and UGC 2712 (apmag 17). Bad Astronomy and Universe Today Forum. [2009-08-01]. ^ 47.0 47.1 Megan Schwamb. Searching for Sedna's Sisters: Exploring the inner Oort cloud (PDF). Cal Tech. 2007 [2010-08-06]. （原始内容 (PDF)存档于2013-05-12）. ^ 48.0 48.1 Schwamb, Megan E.; Brown, Michael E.; Rabinowitz, David L. A Search for Distant Solar System Bodies in the Region of Sedna. The Astrophysical Journal Letters. 2009, 694 (1): L45–L48. Bibcode:2009ApJ...694L..45S. arXiv:0901.4173. doi:10.1088/0004-637X/694/1/L45. ^ S. Alan Stern. Regarding the accretion of 2003 VB12 (Sedna) and like bodies in distant heliocentric orbits. The Astronomical Journal (Astronomical Journal). 2005, 129 (1): 526–529 [2010-08-05]. Bibcode:2005AJ....129..526S. arXiv:astro-ph/0404525. doi:10.1086/426558. ^ Scott S. Sheppard, D. Jewitt. Small Bodies in the Outer Solar System (PDF). Frank N. Bash Symposium. The University of Texas at Austin. 2005 [2008-03-25]. （原始内容 (PDF)存档于2009-08-04）. ^ Mike Brown. Sedna and the birth of the solar system. Bulletin of the American Astronomical Society (American Astronomical Society Meeting 205). 2004, 36 (127.04): 1553. Bibcode:2004AAS...20512704B. 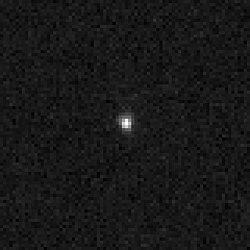 ^ 52.0 52.1 Transneptunian Object 90377 Sedna (formerly known as 2003 VB12). The Planetary Society. [2010-01-03]. （原始内容存档于2009-11-25）. ^ 53.0 53.1 Scott J. Kenyon, Benjamin C. Bromley. Stellar encounters as the origin of distant Solar System objects in highly eccentric orbits. Nature. 2004-12-02, 432 (7017): 598–602. Bibcode:2004Natur.432..598K. PMID 15577903. arXiv:astro-ph/0412030. doi:10.1038/nature03136. ^ The Challenge of Sedna. Harvard-Smithsonian Center for Astrophysics. [2009-03-26]. ^ 55.0 55.1 Rodney S. Gomes, John J. Matese, and Jack J. Lissauer. A distant planetary-mass solar companion may have produced distant detached objects. Icarus. 2006, 184 (2): 589–601. Bibcode:2006Icar..184..589G. doi:10.1016/j.icarus.2006.05.026. ^ P. S. Lykawka and T. Mukai. An Outer Planet Beyond Pluto and the Origin of the Trans-Neptunian Belt Architecture. Astronomical Journal. 2008, 135 (4): 1161. Bibcode:2008AJ....135.1161L. arXiv:0712.2198. doi:10.1088/0004-6256/135/4/1161. ^ Staff. Evidence Mounts For Companion Star To Our Sun. SpaceDaily. 2006-04-25 [2009-11-27]. （原始内容存档于2010-01-07）. ^ John J. Matese, Daniel P. Whitmire and Jack J. Lissauer. A Widebinary Solar Companion as a Possible Origin of Sedna-like Objects. Earth, Moon, and Planets. 2006, 97 (3–4): 459–470 [2010-08-17]. Bibcode:2005EM&P...97..459M. doi:10.1007/s11038-006-9078-6. ^ Elliot, J. L., S. D. Kern, K. B. Clancy, A. A. S. Gulbis, R. L. Millis, M. W. Buie, L. H. Wasserman, E. I. Chiang, A. B. Jordan, D. E. Trilling, and K. J. Meech The Deep Ecliptic Survey: A Search for Kuiper Belt Objects and Centaurs. II. Dynamical Classification, the Kuiper Belt Plane, and the Core Population. The Astronomical Journal, 129 (2006), pp. preprint 页面存档备份，存于互联网档案馆 互联网档案馆的存檔，存档日期2006-08-23..
^ Brown, Michael E. The Dwarf Planets. California Institute of Technology, Department of Geological Sciences. [2008-02-16]. ^ Solar System Exploration: Multimedia: Gallery. NASA. [2010-01-03]. （原始内容存档于2012-08-09）. ^ Solar System Exploration: Missions to Dwarf Planets. NASA. [2010-11-11]. （原始内容存档于2012-08-09）.